Instructions are in the README file included in the zip. I have tried it, reminded me in a way of Dunedit, my first made dune 2 editor. I missed the spice dunes, but then again you could not know this. They are character + in the map. They are the hilled spice tiles. I have made a map, and played it. Worked great and i really like that it is getting easier to create maps. My next step is to remove the limitation i have put , and the strict naming of the skirmish maps, ie mapXX.ini is not a good way to share maps. I mean, i have a map named map02.ini, and i bet you have one too (but being a totally different map..). Perhaps you could even have a 'randomize map' algorithm, so you can 'start' from there. Removing the limitations would be great. Removing the strict naming would also be nice. Nice idea, but pretty hard. But if I can't work it out I can always take a look at D2TM's build in map generator. Ah, darn it. I added the file as INI, but the forum does not accept these. I have zipped it. But you can also find it now at the repository of D2TM (map02.ini). The 'create random map' algorithm is actually very easy. You should take a look at the map generation of d2tm for instance. It is fairly straight forward, and I intend to improve it. But for now it will do. Here is the map, zipped. The link in the first post now links to a newer version. No random maps yet, but I decided to put this one online as I came across some nasty save/load bugs. Also has the Spice Dunes added. And, when you place spice over dunes, they will be converted into spice dunes. There seems to be a bug in the new version, regarding placing 'start' positions of the players. In the old editor, it works fine. But when i load up the map in the new editor, and save it, the start positions in the editor do not resemble the start positions in game. Great that you found the bug. Is this fixed version available for download? Yeah, its still the link in the first post. The first time you load a map, you might have to replace your start points. Notice when you mirror diagonally it isn't really mirrored: the mirrored part is also flipped. I thought it looked better that way. I really like this feature :) However, it does look like the mirror function shows you a 'preview'. Although it looks like it actually applied it. I think it would be cool to have a checkbox called "auto-apply". So you can mirror further with the previous mirror action. Really appreciate this input, thanks! I've made an apply button, so after you've pressed it you can mirror again. Link in the first post updated. Nice. I have update the SVN with this latest jar as well. True. That is most likely because the game itself does not support maps other than 64x64. I assume the map editor does calculate the positions correctly, but the game interprets them wrong. but not everything, how does the game deal with maps that are not the correct shape/size? So can the map names now be anything? In the new DEMO (not yet released) yes, that is possible. You are free to contribute. When i'm finished with refactoring and fixing up some things i've broken along the way, i'll release a new demo. 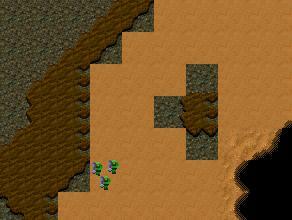 Would it be possible to create a tileset for infantry rock on sand? I was trying to create a map which had infantry rock bordering sand, and also little 'islands' of infantry rock in the sand, and it came out horribly wrong. Sorry, I don't understand what you're trying to do. Could you perhaps show me? (picture?) or explain differently? Ah yes.. that is a problem right now :). Of course anything is possible. So i could create a 'mountain' (thats how i call it anyway :)) bordering with sand immidiately. Would perhaps also require a 'border with spice' variant. Perhaps i can think of something better so you can just apply it on any kind of 'terrain' beneath it. Ah okay. Perhaps I should set up a thread about new tilesets because I have a couple of other ideas.